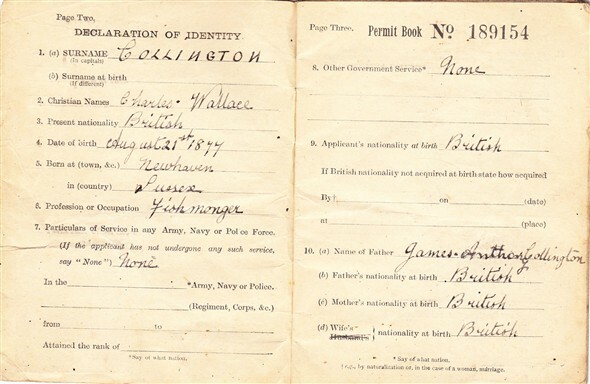 My grandparents Charles and Mary Collington were both born in Newhaven in 1877 and 1880 respectively. Charles was born in 4 Catts Cottages on Denton Island, the cottage would have stood about where the new bridge joins Denton Island today, and Mary in 68 Lewes Road, Newhaven the first of 11 children born to Joseph and Jane Pittam. 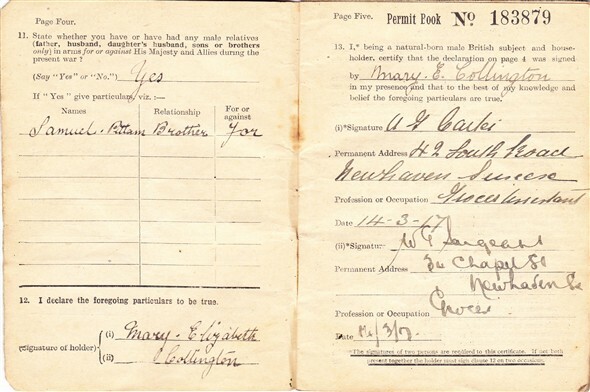 Charles and Mary married in St Leonards Church, Denton in 1901 and together ran a wet fish shop at 19 Chapel Street (at the time these permits were issued) and later they became publicans of the The Volunteer Inn, 1 South Road, Newhaven. Finally moving to 18 South Road and went back into the trade they loved, a Wet and Fried fish shop until they retired in 1955. 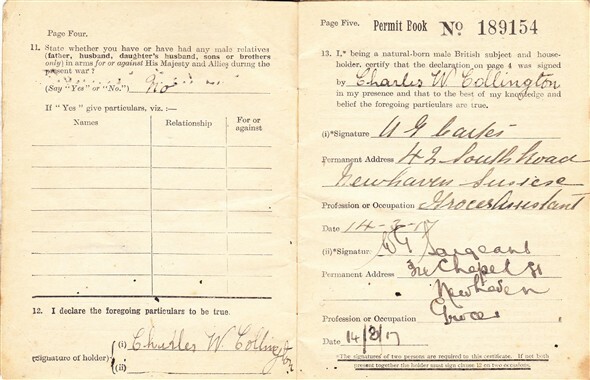 Charles and Mary would have needed the permits to enable them to meet the early morning train and collect the wooden boxes containing iced fish, sent down from Grimsby overnight. With 20 or more boxes onboard a large hand-cart Mary would push the hand-cart from the town train station up to their Chapel Street shop. 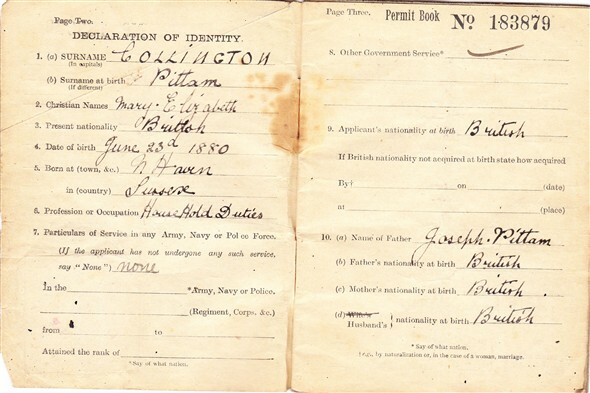 Interestingly in Mary's permit book (page 8-9) an entry can be seen for the port of Dover, this I believe was to meet her younger brother Joseph Pittam when he was repatriated with other wounded soldiers - sadly he later died from his injuries. His name together with the other members of the parish killed in World War 1 is inscribed on a stone plaque in St Leonards Church, Denton. 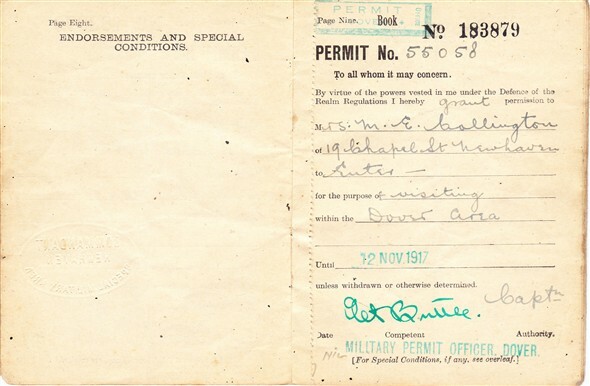 This page was added by John Hills on 22/10/2011. 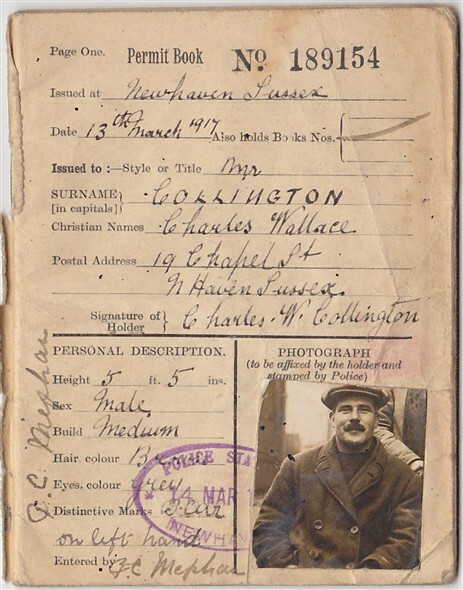 Hi John, Very interesting story on Mr Collington. As very young lads, we always went to his shop for a pennyworth of chips, he would always gave us a little extra. Liked him a lot. Glad you enjoy the website John, nice to know we are appreciated. On reading this article, I am sure my great grandmother lived on Denton Island in Catts Cottages. Her surname was Lipscombe, and she had fourteen children, one of whom was my granddad Joseph Robin Lipscombe. 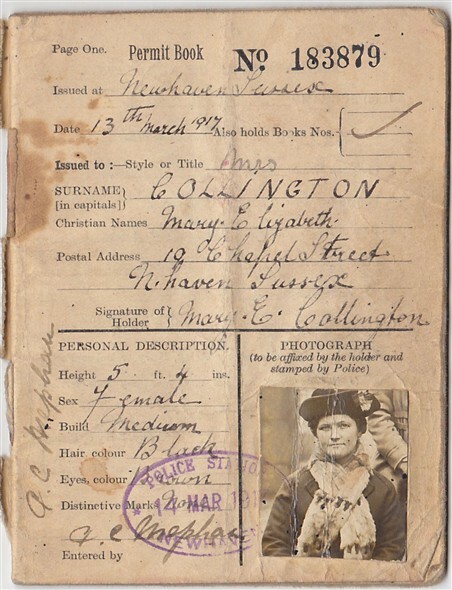 I am trying to trace anyone with the surname Lipscombe still living in Newhaven. I must have a lot of family I know nothing about, grandad having been one of fourteen. Any information would be greatly appreciated. Hi John, so interesting to read your story, I have an idea that your great grandparents The Pittams, could have been neighbours with my great grandparents The Lipscombe's. They had fourteen children, my grandpa being one of them Joseph Robin Lipscombe. I would love to chat to you about this. please would you e'mail me with a contact number. Look forward to hearing from you. Marilyn Ponder (nee) Lipscombe. Hi Marilyn, I will contact you via email, perhaps I might be able to help you in your quest. When I started work at Bannisters Builders in 1961 the shop foreman was a Ernie Lipscombe, his father also worked there but I cant think of his christen name. He used to bake potatoes on the coke stoves we had to heat the workshops. Lovely old chap, perhaps John Hills will know his name, he and his brother were always in there warming themselves. Can say as I do Terry but it was lovely and warm in there ! But I ask Terry the plumber he might remember ! PS His hame was Henry Edwin Lipcombe but was known as "Harry" ring any bells Terry ! Thats him John, Harry, I seem to remember big white moustache. His son Ernie was joiners shop foreman. He then became a site foreman at the Guinness Trust site when all the houses were built there. He so impressed Guinness's they gave him a job as a Clerk of Works, I don't remember seeing him again. Going off on a tangent, the chap Ernie took over from at Guinness Trust was a Mr Jewell, Steve Fears the bricklayer foreman used to refer to him as Jimmy Jewell until he was overheard by him, I was loitering about outside the site office and heard the dressing down Steve got. Funny how you remember these things. Sorry Marilyn, got a bit nostalgic there, I wonder if you are related to Harry and Ernie. Thanks Terry for your reply, Ernie's first job as site foreman was on the house I still live in, he made Keith Godfrey double nail each roof rafter and ceiling joist ! and Yes Marilyn is related to Harry he was the younger brother of her Grandfather Joseph Lipscombe I have just discovered. Good old Keith, I could never keep up with him when roofing until I discovered he was the king of the one nail rafters. We used to have competitions for fastest rafter cutting and fixing, no circular saws then, all cut by handsaws. When it got to the interior it got worse, doors, locks, etc we used to compete with everything. We were also on a bonus scheme so it paid to cut corners but Ernie or Maurice Balcombe or Les Beal used to catch up with us eventually. Sounds like your house was done properly, am pretty sure I worked on it as well, hope its ok.
My father was John (Jack) Parker was born in Newhaven. His mother's Maiden name was Lipscome. She was married to my fathers father, who was supposedly a German sea captain. She re married and died some time around 1951 as I have a picture as a baby sat on her knee. My father's brother was called Ron Parker who lived in Norman Road Newhaven. My father used to work as a tailor at Parkers Tailors shop near the fire station in Newhaven Before joining the RAF medical corp. he later worked at St Dunstans after the war, before moving to Sheffield to marry my mother. Sadly my father passed away 20 years ago. I would love to hear from anyone who may be able to give me any further information. At Bannisters Builders the apprentice above me was Ron Parker, better known as young Ron, his father was Ron as well. I think he has been mentioned before on this site before, he had his own joiners shop and still lives in the town. John Hills will know I am sure. Going off on a tangent again, Ron and his dad used to have a boat they went fishing in I think it was made by Lower's, he was always talking about going fishing with his dad.